and the blonde is an actual Maddie Mod. in many different styles of swimsuits. I have found a lot of information about the Mego Corp., and a lot of photos of Maddie Mod dolls and outfits. But I've found almost nothing about the history of the doll. © 1968/PRINCESS GRACE DOLL/HONG KONG. She's also got HONG KONG written on the nape of her neck. I'm assuming the dolls were introduced to the public in 1969. I don't know if Princess Grace was a subsidiary of Mego, or a separate company that Mego bought out about 1970. I HAVE read that the doll was named after Madeline Abrams, the wife of David Abrams, the founder of Mego. © MEGOCORP. MCMLXX/HONG KONG, and there is nothing on her neck. My sisters and I received Maddies for Christmas 1970 (and we always liked the clothes for her more than the dolls). The book Collectible Doll Fashions: 1970s, by Carmen Varrichio, copyright 2003 Schiffer Publishing, shows Maddie outfits sold from 1970 to 1977. The 1976 and 1977 clothing packaging, although still saying "Maddie Mod" on the front, has a company called Summit Industries Limited as its manufacturer/distributor. Another piece of trivia: in 1971 Maddie had a boyfriend named Richie with his own line of clothing, although I've never seen either the doll or outfits. There are some NRFB outfits that I can now find by googling that are dated 1967, I assume for the 1968 market. Were her outfits sold before she was? Maddie had her own competitors. Some of them were: Marcie Mod by A&H Doll Manufacturing Corp., Maxi Mod by Shillman, Mini Mod by Totsy, and Missy Mod by Edico Productions. and she is definitely high-heeled. Maddie Mod, on the left, has flat feet that are slanted just a little. 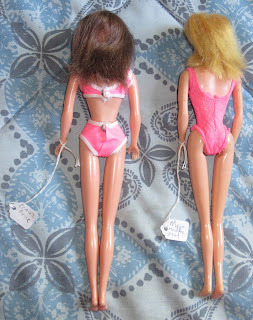 I was at a garage sale yesterday and the seller told me about two dolls she had received as a child in the 1970s. One was a Patsy Cline doll and the other was a male country singer whose name she could not remember off the top of her head. I have seen umpteen Dolly Parton and Marie Osmond dolls from that time period, but have never heard of a Patsy Cline doll. I don't know if Patsy and her male counterpart were fashion dolls or bigger dolls. I know there was a Patsy doll in the 1940s and 1950s, but that's not what the woman was talking about. Have any of you seen a Patsy Cline doll from the 1960s or 1970s?